Sam and Silo is a strip I’ve only recently started reading and hadn’t even really heard of before that, so it’s new to me, but I always kind of assumed what we were reading were repeats — either along the lines of Crock, where the syndicate acknowledges the strip ended long ago but keeps sending out reruns to placate the trufans, or along the lines of the Family Circus or Blondie, which are ostensibly still being created anew every day but reruns keep being submitted because who cares, honestly. Today, however, I was horrified to learn that Sam and Silo is still being produced today, and that the Sam Silo creative team has thoughts on Donald Trump, and that those thoughts are that Donald Trump is horny. Wow, congrats to “Arthur” for not just taking Estelle’s ten grand and then peacing out, but going for another payday! He’s running a Spanish Prisoner scam, with Arthur himself as the prisoner! Will Estelle fall for it? She already has her standard grocery bag ready in preparation for his arrival! That baguette and celery isn’t going to eat itself! 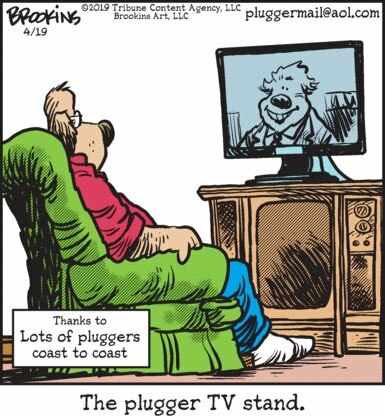 Pluggers has, in a general sense, been ripping off Jeff Foxworthy’s “You Might Be A Redneck” bit for years, but I think it’s sad to see that they’ve now succumbed to the entreaties of lots of pluggers coast to coast and have chosen to rip it off directly. I was going to do a kind of dumb “Ho ho, the sequence of noises Sam describes sounds vaguely sexual, which certainly has ribald implications for what the relationship between the two title characters is like!” joke, but, you know what those noises actually sound like? A murder. Like a guy was getting murdered and tried to call the sheriff but never was able to choke out a cry for help before his antagonist shut him up … forever. This certainly has horrifying implications for what the relationship between the two title characters is like! The deal with the “Wizard” character in Shoe is that he’s the computer repair/tech support guy, because, ha ha, you have to be a darn magician to deal with those computers, am I right people? But the Shoe creative team long ago decided that they’re not going to hand-hold potential new readers of the strip and so no, they’re not going to ever explain why most of these bird-people are dressed like ordinary humans but one of them is wearing a wizard outfit, you just have to get it from context. This exchange is vaguely on-brand for his character because he’s being asked for his tech opinions, but the discussion really falls under the umbrella of thought leadership rather than practical advice. Anyway, I like to imagine that if you came into this cold, you’d think that this wizard-bird, using his magical powers to scry into the future, is looking forward to the day when the primitive ground-dwelling ape creatures develop intelligence and supplant the treetop civilization the birds have created. Monday is starting with BIG MARY WORTH NEWS, everybody: it turns out that Professor Ian Cameron will not just give you a good grade even if you don’t do your assignments, no matter how vigorously you wink at him. With that out of the way, we can now begin to explore the fact that he’s been ignoring his wife for entirely non-affair-related reasons, probably because he just doesn’t like her very much. Dennis Mitchell only received the nickname “the Menace” during his trial for crimes against humanity, when the results of his awful genetic experiments came to light, but there were signs of what was to come from a very early stage in his life. 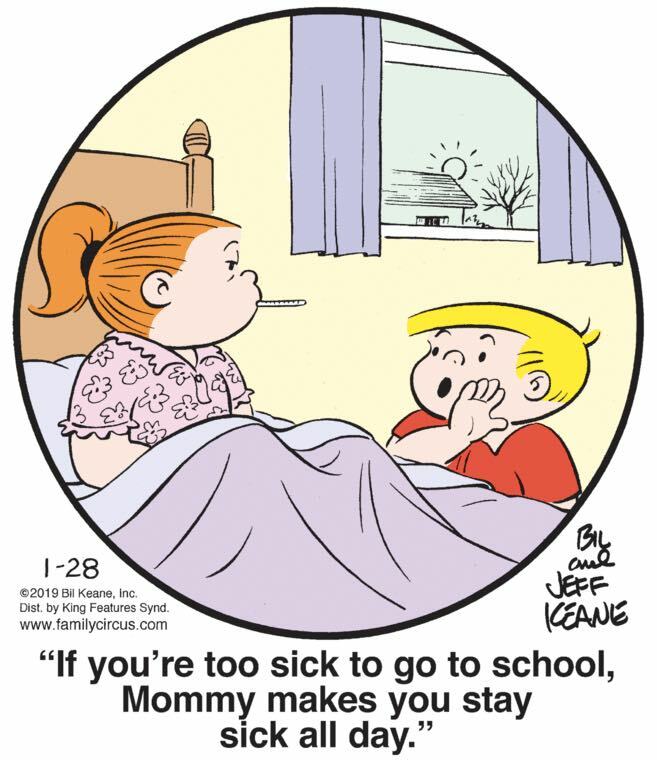 Ha ha, kids sure say the darndest things in Munchausen syndrome by proxy situations! I admit that I’m still having a hard time trying to figure out what Sam and Silo’s deal is, even in terms of its cultural situation, by which I mean: what are the things outside of itself, in the larger cultural universe, that it references? Today we have name-checked the most famous political crisis in American history and … a 2006 cheating scandal in international test cricket? 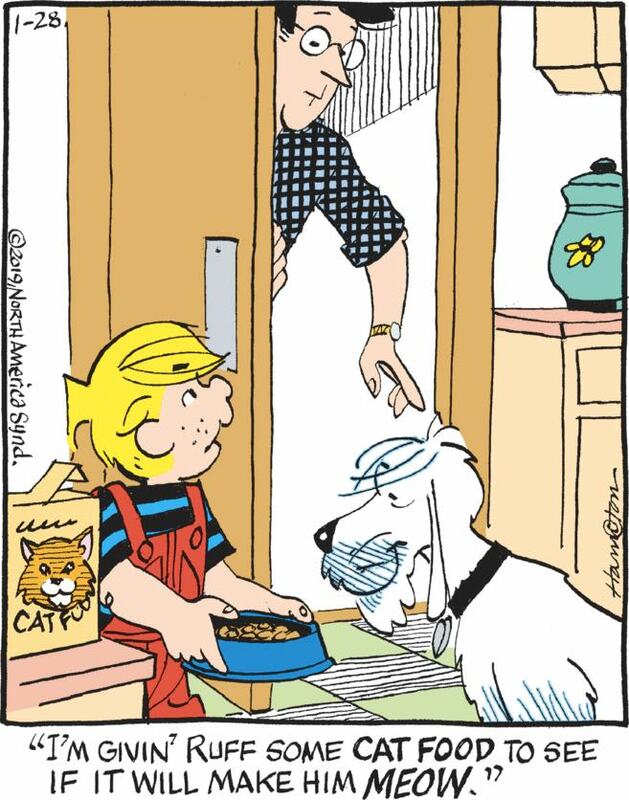 Never change, Sam and Silo, you delightfully unplaceably weird strip!